Almost all of us have succumbed to it. It didn't even exist 15 years ago, but it's now part of our daily lives. We love it and hate it at the same time. It helps us keep in touch with friends we wouldn't otherwise, but it has also become a compulsion that steals our time. There are a few recent studies about how social media (Facebook in particular) makes us unhappy. But I'd contend that it is also making us a lot poorer. I know for a fact that most employers detest social media. It's a distraction that makes employees less productive. Several years ago, employers could simply apply a filter to the computers at work and keep it's employees away from it. But when everyone has a smartphone with a data plan, there's no hope. But let's shift away from the point of view of the employer. What about the average worker? Getting easily distracted makes you less productive at your job, right? Have you ever been sucked into the vortex? You're crunching along at your job getting a lot done when suddenly you get a notification. Most of the time, you check quickly and move on. But this time, you check it and become immediately engaged. And then something else catches your attention. And before you know it, you've been scrolling for 20 minutes and forgot what you were working on.So what would happen if you removed the distraction? So what would happen if you removed the distraction? Got rid of those notifications? You'd do a better job and all the perks that come along with it – like raises and promotions. 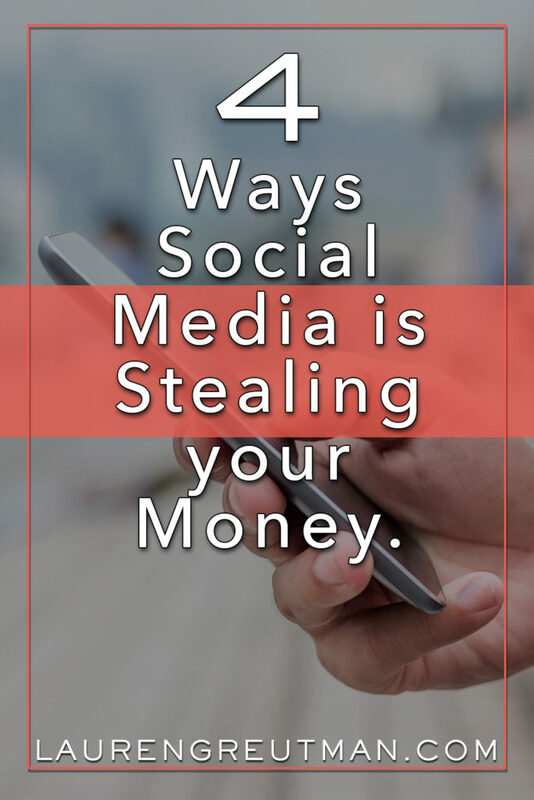 Ask yourself, is social media stealing future raises and promotions from you at your job? And this applies to self-employed people as well. Speaking for myself, I'm not impervious to the social media vortex. If I have any chance at getting a bunch of work done, I've got to keep the Facebook browser window closed and notifications off. When most people decide to post on social media – whether is be a tweet, FB update, Instagram, Snapchat, etc. – it will most likely be vain. Yes, that sounds bad, but hear me out. No one wants to show real life. They're gonna show just the good stuff… the selfies when it's a good hair day, a home cooked meal when it's healthy and photogenic, children when they're actually behaving. My friends also post status updates letting all of their friends know about the beautiful house or car they just purchased. Job promotions, new clothes, weight loss success…. this list goes on. But real life includes bad hair days. The kids screaming and destroying the house. Unfolded laundry. Cereal for dinner because you're too tired. Real life also includes job loss, foreclosed homes, repoed cars, weight gain, divorce… lots of ugly stuff which rarely makes it's way to your news feed. So there's this mismatch of information. We're clearly aware of all of the bad stuff that happens in our own life, but we only see the good stuff in the lives of our friends. It's then easy to assume that everyone else has it better than us. And the feelings this creates can give us a sense of entitlement to the “good life” that others have. Be careful… this feeling often causes us to make stupid financial choices. Houses, cars, and clothes that we can't really afford… but unbeknownst to us that our friends can't really afford either. 3. It makes you sadder. So you spend more. This goes hand-in-hand with the point above – they work to reinforce each other. As mentioned earlier, several studies have shown that Facebook makes you depressed. But did you also know that people spend more money when they are sad? You'd probably argue that there's no way this would affect you. You'd spend the same amount of money whether you were sad or indifferent. That's what the participants in a study thought too. Turns out that this phenomenon is something that people are completely unaware of. It's true – and researchers know exactly why. I know there are many different social media channels, but for now, I'm just gonna focus on the big one – FaceBook. In the past 5 years, advertising sophistication has matured by a staggering amount. Have you seen the futuristic sci-fi movie, Minority Report, starring Tom Cruise? There's this scene where he is walking into an office building, and he's inundated with advertisements made specifically for him. There are computers that can scan your vitals, size, etc, and predict what you might be interested in… resulting in advertisements made with laser precision. Right down to the size of his clothes, the beer he likes, etc. Folks, we are already there. Does this sound familiar? When you scroll through your news feed, almost all of the ads you see are at least somewhat relevant to you, right? Or you've probably seen what's known as a “re-targeting” ad. Maybe earlier in the day you visited a website or online store. Then suddenly you see their ads pop up in your news feed. This is all on purpose and surprisingly easy to set up. But there are several differences between real life and Minority report. The movie Minority Report takes place in 2054. It's only 2017. In the scene, as he's walking through the lobby, John Anderson (the main character) is clearly overwhelmed and annoyed at all of the ads right in his face… as if he would prefer to turn them off. For us, we choose to have the ads placed literally right in our faces. Walk down the street and watch how many people are glued to their phones – viewing several ads per minute. And doing so completely voluntarily. We don't need computers to scan us to find out what types of products we might purchase. Instead, we freely give the information. Our age, marital status, every website we've visited – we make this information freely available to advertisers. And if you think you are impervious to ads shown in your news feed, think again. Advertisers know just how much money they are paying per click to their website and per sale. So they will keep showing ads if people keep buying. It's simple math. Advertising works, and it makes us spend more money. None of us is immune. Should you completely get off of social media? That's a personal question. But I think a break is a fantastic idea for just about everyone. And during this breaks, watch to see how it affects your spending. My guess is that you'll end up keeping more of your money. And you'll be happier too. While you may not be able to control what Big Data collects, you can certainly control what you see. AdBlock+, Ghostery, Social Fixer, FB Purity—all free apps that remove the advertising, block trackers and let you control what you see on your feed. Tor, the free privacy browser also gives you a lot of control. Yes, you have to take proactive steps to use these tools, but hey, they are all free! Install them on all your devices and TURN OFF NOTIFICATIONS. It is so easy.